Before the dawn, as another front roared over us, I lay awake thinking about those men and women who came to make their lives on this land, and before them, the Maori who had lived for centuries on this land. I thought about how they would never have asked themselves why they did what they did. When almost everything you do is necessary for life, when the failure to do something means personally suffering the consequences and very often immediately, the question ‘Why do I do this?’ doesn’t even make sense. Even we, here, in a limited fashion, live like that—when we climb into the hills in search of dry firewood, we don’t stop to ask what the point of it is. There is an immediacy and a self-evident relationship between what we do and the life we live. But today that is not how most people in the modern, industrialised world experience their lives. How many spend their days wondering what the point is of what it is they do, day after day after monotonous day? By far the greater portion of most people’s lives is spent working, and so it must be, if we are to live, but when that work is so divorced from living, when we spend our days merely doing the bidding of others, a bidding which all too often is patently absurd and merely emphasises with astonishing cruelty the pointlessness of it all?—cursed with self-awareness, what a torment it is to observe your life passing purposelessly in this way, and yet feeling helpless to escape it. We have unthinkingly made for ourselves a monstrous and exquisite trap, a maze from which we can never escape, into which we are born and in the midst of which we must die. 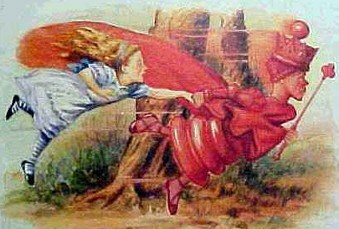 We tell ourselves we are blessed with all manner of freedoms—and undoubtedly we are, in some senses, freer than our forebears—but for all our freedom, we remain enslaved nonetheless, compelled like the Red Queen to run and run without getting anywhere, chasing status, chasing wealth, chasing our tails. But we are idiots and fools, too, for we will not help ourselves. Instead, we drive and push our children like cattle so they can join us in this mad and endless pursuit of nothing, we compete ourselves into a state of stupor, worn out, numb, confused because when we lie down at the end of each day in exhaustion, we cannot understand how we find ourselves in this condition, confused because we constantly assure ourselves we can make of our lives whatever we will, only to discover we have almost no control over them at all—we simply wake up one day and find we are in a place we don’t recognise, as if we have stepped blindly onto a train heading who knows where and then slept throughout the entire journey. The masterful Russian storyteller Mikhail Bulgakov observed precisely this reckless squandering of life: ‘This, of course,’ he wrote, ‘is something that happens more often than not in life. A man may be engaged in some occupation for twenty years, such as studying Roman law, and then in the twenty-first year it suddenly transpires that Roman law is a complete waste of time, that he not only doesn’t understand it and dislikes it too, but that he is really a born gardener and has an unquenchable love of flowers’. If flowers are your thing, go and tend them, but how many will? Of course, of course, these observations are hardly new. People have been saying much the same thing for millennia—‘How much this fierce condition of eternal hurry . . . is likely to defeat the grandeur which is latent in all men’ (de Quincey), ‘Believe me, it is the sign of a great man . . . not to allow his time to be frittered away’ (Seneca), ‘It’s all a nonsense, and a man who at the behest of other people and not for his own passion or need works himself into the ground, for money or status or whatever else, is always a fool’ (Goethe), ‘To preserve his freedom he was prepared on countless occasions to throw away or reject things the world at large saw as advantages or blessings’ (Hesse)—I could pile quote upon quote, the wisdom is so old. But that is not the point. This is the point: for all we know it, for all our awareness of our situation, however much we regret it, we seemingly remain incapable of doing anything to remedy it. For all we claim to have freedom to make our lives as we wish, we act as if we have nothing of the sort. We pause only long enough to wring our hands and lament the miserable condition of our existence before we start running again, fearful lest we have fallen already too far behind. We have not helped ourselves, of course, by killing God. He gave both reason and promise. Now we have neither. And so we spend our lives coming to terms with the fact we have lives to spend. Once we had answers, but now, with our reason—the reason we esteem so highly, the reason we congratulate ourselves on possessing, oh magnificent reason! oh wondrous reason!—with this we have stripped ourselves bare and wonder why life feels so cold. In this way, how many lives have become miserable and cheap and devoid of all substance! How many lives have contracted into little more than a series of conveniences paid for by days of monotony, one hardly distinguishable from the next! And I needn't be reminded there was no Golden Age to which we might return. That is not the point either. Nothing is gained by romanticising the past. But there is something in the idea that when we are engaged in doing tasks that bear immediately on life, then we need not ask ourselves why we do them. If we would live, then we do them; if we would rather die, then let us be idle, and let that be our choice. But to spend your days at meaningless labour, enriching others at your own expense, without even the promise of a better life to come, there can be no surer way of skewering your own soul. These are not uplifting thoughts, I grant you. But this is merely doing what Camus called being ‘logical to the bitter end’, something, he said, which it is almost impossible to be, because so often we find the end abhorrent, the more so because it was given us by logic, and logic will never take it back. But there remains this to be said. Our lives are not governed by fate. We do have a certain degree of freedom, some of us at least—it is merely a question of whether or not we wish to use it.